You’ve put in a lot of work to give your family everything they need. Your little ones have the perfect nursery. The older kids have the bunk beds setup in their room. Life has gone from parties and dancing to diapers and 2am wakeup calls for feedings or nightmares. Sometimes it can be hard for the baby or the kids to get to sleep or to stay asleep. The best humidifier for babies and kids may be one of the final pieces of the puzzle you need to help your family healthy and happy. The humidifiers that you’ll find in this category have protections in place to prevent accidents. They also work to remove bacteria from entering the indoor atmosphere. Infants especially need a little help in letting their immune systems develop and that’s what these humidifiers will let you do. The best-rated options in this category are offered for your review below. Above anything else, you need to have a humidifier that can run silently when you’re placing it in your nursery or a child’s room. The white noise of a humidifier can help to put kids to sleep, but it can also wake them up in the middle of the night if it’s too loud. Look through the best humidifier reviews online to see how silent each make and model can operate so you don’t have to struggle through your morning routine the next day. You’ll also want a humidifier that will keep running all night long. Toddlers and young children need 10-12 hours of sleep per night (even though they might actually give you 4-6 hours of sleep), so you need a humidifier that can run for that length of time. Just fill up the tank in the morning and you’re ready to go the next night. Humidifiers in this category also need to give your kids some incentive of ownership for them to take care of it. After all, this is going to be in their room, which means they are going to take possession of it whether you like it or not as a parent. For this reason, several manufacturers have developed humidifiers that are in fun animal shapes or bright and bold colors so that kids will want to have them and take care of them. You might still have to hunt down a missing shoe on a regular basis, but with the right humidifier, you’ll at least feel more rested in the morning when you do. No one likes breathing in air that is overly dry. It feels like a scratch at the back of your throat that never really goes away. If it’s a hot day and the air is dry, then your lungs feel like they are burning. Now take those feelings and look at them through the eyes of a child. Every sensation, every problem, every discomfort you would experience is going to be magnified 100x or more. A humidifier can help to relieve many of those issues. Then there’s the fact that dry air can be very inviting for bacterial and viral life. Yes – some humidifiers can also promote bacterial contamination of an indoor environment as well. This is why it is so important to look for germ-free humidifiers. The advantage here is that you can reduce the chances of breathing in a virus while you reduce the risk of having the humidifier itself contaminate the air in your child’s room. You’ll notice that most humidifiers in this category are either cool mist humidifiers or ultrasonic humidifiers. This is because a humidifier with a heating element is generally not safe around unsupervised young children. These two humidifier options are also inexpensive to operate, provide a similar humidification result, and operate in near silence. 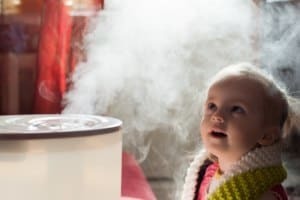 We’ve covered the basics of what a humidifier for baby or kids can do for your home, but let’s individualize that process a little bit. Every family has unique needs that must be met so everyone can be happy and healthy. This is where looking at some specific options that aren’t available on every humidifier becomes important. Here are the top 3 additions to consider wanting for your investment today. Adjustable humidistat. Humidity levels can vary from day to day, which means your humidifier needs to operate differently on a daily basis. With a humidistat installed on your unit, it becomes much easier to maintain a targeted humidity percentage so everyone can be comfortable. Automatic shutoff. Maybe your children are very sensitive to sounds in the middle of the night. The humidifier, if it is still running, could wake them up and then keep them up. An automatic shutoff option can let your humidifier run as they fall asleep and then shut off for you so they stay asleep. Demineralization pads and filters. There’s a good chance that you’ve got distilled water on hand, especially if this new humidifier is going into a nursery. On the chance that you need to use tap water in your humidifier, however, having demineralization pads or filters as an option can limit what goes into your child’s lungs every time they breathe. What Are the Prices of Child-Friendly Humidifiers? Humidifiers that are designed to operate in nurseries or in the rooms of young children are slightly more expensive at entry-level price points than other humidification options. You’ll find many humidifiers in this category begin at the $30-$40 mark and then go upward in price from there. Specialized humidifiers or ones that have animal shapes may be in the $50-$75 range. Considering the value of a good night of sleep, however, that is a small investment to make for the health of your entire family. There aren’t any evaporating pads, wicks, or filters that you’ll need to replace with this humidifier. You have low and high cool mist settings to use. This humidifier offers ultrasonic technology that keeps it surprisingly quiet as it operates. Cleaning is even kept to a minimum thanks to the Silver Clean Protection that is included within the water tank of this model so mold and mildew doesn’t develop as easily. With 10 hours of operation, you can place this humidifier virtually anywhere in your nursery or toddler room to help them rest better every night or at nap time. At this price, we highly recommend giving this model a chance. This unique humidifier is shaped like a mushroom, giving your nursery or child’s bedroom a little extra character. What we love about this model is that you can operate it with a USB power supply instead of a standard outlet. Setup your computer, play some gentle tunes to help your kiddos get to sleep, and run the humidifier at the same time. It shuts off automatically when water runs out, offers aromatherapy options with an essential oil diffuser,,. and is made from eco-friendly PET materials. And have you seen the price? We all want what is best for our kids. Some humidifiers don’t seem to share this idea. Even models that promote the fact that they kill bacteria can actually release it into your indoor environment. That’s stuff that goes into the lungs of your children while they sleep. It’s enough to make you shudder. It’s for that reason we love this particular humidifier. Not only can you set humidity levels and control the direction of the mist with a 360 degree nozzle, but you get up to 12 hours of use with every tank refill. It even offers a nightlight function. That’s why it’s a great addition to any room with a baby or kids. This particular humidifier has many of the features families like to see when they want something for their nursery or kid’s room. It offers ultrasonic technologies for a superior level of quiet. The 1.5 liter tank lets you get through an entire night without a refill. Dual-speed controls and a 360 degree rotating nozzle give you flexibility. If water runs dry in the tank, this humidifier shuts off. You have a nightlight option. It’s even priced very competitively for all of these features. What’s not to love? Are your kids stubborn about the inclusion of a humidifier that “isn’t fun?” The young ones will have a difficult time rebelling against this fun ultrasonic frog humidifier. You’ll get the added benefits of better humidity in their room while still receiving anti-microbial controls so you don’t have mold or mildew buildup within the machine. The tank holds 1 gallon, can be filled in most bathroom sinks, and contains no fabric at all. It’s fun, it does its job well, and the kids love it. That means we love it too and why it receives our recommendation today. Sometimes our kids wake up with a cough that just doesn’t want to go away at night. We’ve spent countless nights sitting in bathrooms with the showers on so they can rest while we watch reruns of a show on our tablet since we can’t go back to sleep. Then we discovered this humidifier and life has been so much better. The humidity levels disperse evenly so you don’t get pockets of heavy air. The aromatherapy compartment lets us use essential oils to naturally ease coughs and sniffles that wake the kiddos up. The filterless design makes maintenance incredibly easy. We’re sleeping better, they’re sleeping better, and everyone is happier. If you have similar struggles, then give this humidifier a try. Some bedrooms have multiple challenges that must be addressed in regards to air quality. You might have a dry environment, but there might be allergens in there as well that are causing your kids to wake up multiple times at night. This particular cool mist humidifier gives you an air purifier, an aromatherapy diffuser, and an ionizer so you get the best air quality possible. It’s safe, it’s quiet, and it will get the job done in a nursery or any other bedroom up to 220 square feet in size. Make any changes to a kid’s room and you’re guaranteed to hear about it. “That’s my stuff.” “Don’t move my things.” “If I want a messy room, then I’ll have a messy room.” Sound familiar? Yet when you add this particular humidifier and essential oil diffuser to the environment, the complaining goes away. That’s because this humidifier is small enough to sit on top of a dresser, yet powerful enough to improve the indoor environment of a large room. 7 colored LEDs and an automatic shut-off function are included features. At this price, it’s definitely worth a try. Fueling a child’s imagination can help take them to brand new worlds. They experience anything with their creativity. Movies like Star Wars help to do this very effectively. One of the most beloved characters in this movie franchise is R2D2 and now this is has become the humidifier droid you’ve been looking for. It features anti-microbial technologies to fight mold and mildew. It’s small enough to be a travel humidifier and uses any standard size water bottle for fuel. You might not need to navigate an X-Wing as part of your job, but this fellow will save you from a room full of dry air. This humidifier, in its various configurations, has been a staple in our home for years. The warm mist design does an effective job of relieving coughs, sniffles, and even tough cold symptoms. Hold a towel over your head while breathing in this water vapor and you’ll feel better in minutes. This model offers the new VapoPad technology for some aromatic relief as well. Run it at night with the pad and everyone in your family will sleep a little bit better. The VapoPad works well for about 10-14 days under normal conditions. VapoPad link: Click here to compare the price on Amazon and find the best deal. The best humidifier for baby and kids is surprisingly affordable. It’s also remarkably effective at what it does. Stop having restless nights and start getting some sleep by making this small investment today.